Planting a tree? Installing a fence? Retrofitting your sewer line? Planning a multi-level ICBM-proof subterranean addition to your house? Unless you have a curious disregard for your safety, lack any sense of civic responsibility, and have a grotesque surplus of money to throw away in fines and court costs, then it's best that you call 811. Soon after you relay the relevant information, such as where you live and where exactly you want to dig, a veritable infrastructural army starts to descend upon your homestead. First comes a cadre from the electric company followed by another from the gas company. Next comes the phone company and the water company. 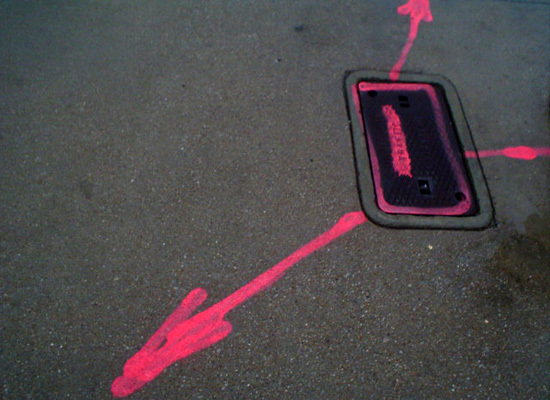 Perhaps the first wave shall come from the cable company who are then followed by locators from the sewer department and various other public works agencies, all of whom are ridiculously fitted with high-tech GPS gadgets and the entire GIS database of the urban service grid. Whatever the order it may be, they will all leave behind their own markings, as prescribed by the nearest orbiting satellite, punctuated by semi-cryptographic signs, numbers and colored flags. 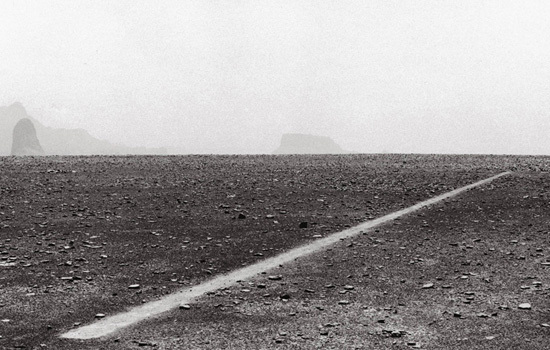 An invisible landscape, unknowable to most of us in any other circumstances, enigmatically makes its presence. The concept of a central organizing body from which you can actually find out what might be hidden under your property alone makes our minds reel with possibilities. For instance, we can't help but imagine places where there is a particularly dense built-up of natural and cultural layers, and calling 811 would thus bring in scientists and local historians. You ring, and archaeologists come to mark the boundaries of unexcavated Native American burial mounds. Strange globular shapes right next to even stranger figurative etchings left by a paleontologist above an ancient fossil bed. Strings of numbers specifying the depth of an ancient landfill or the charred remains of a city, but which seems only augurs can discern. Then again individual homeowners probably would never dig deep enough to disturb fossils and burial mounds. But that you could actually find out (in our fantasies), and so easily at that (again, in our imaginations), whether or not they do lie underneath, simply excites us. Taking this reverie to its next logical phase, representatives from the Vatican come to visit in the middle of the night, while you're sleeping. In the morning, you find weird, esoteric inscriptions spray painted on your lawn. After consulting a leather bound manuscript handed down through generations of Freemasons, you learn that these inscriptions mark the border and dimensions of an anti axis mundi. 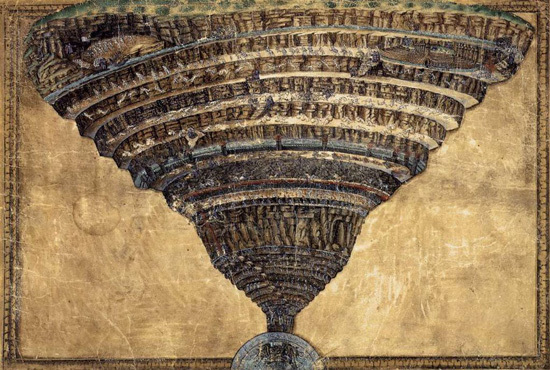 It would thus be inauspicious to dig right there, because directly below — way, way down there — lies the gate to Tartarus. Speaking of digging, especially through historically rich urban underlayers, there are two projects worth mentioning. 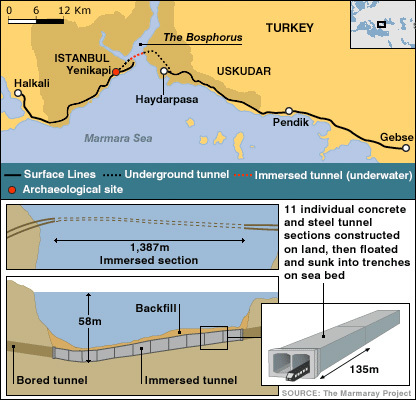 First is Turkey's Marmaray Project for a new subway line, parts of which will be submerged under the Bosphorus. The entire project was expected to be completed by 2009, but that may be revised due to the discovery of a Byzantine port where a tunnel terminal is proposed. So far the archaeologists have uncovered eight wooden boats that are at least a thousand years old, parts of the ancient city wall, and various clues to what it was like to live in the city in the 4th Century. 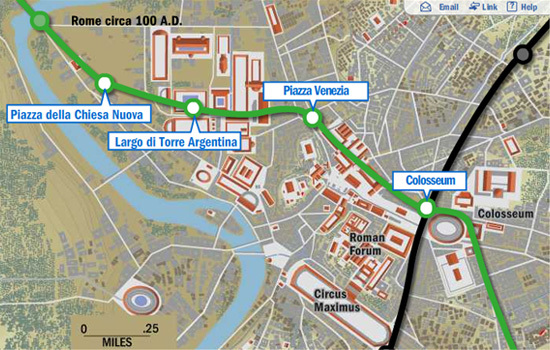 Second is Rome's plan for a third subway line that will go right through the historic center of the city. The perennial tug-of-war between preserving ancient treasures and developing much-needed infrastructure is moving underground, as the city mobilizes archaeologists to probe the bowels of the Eternal City in preparation for a new, 25-kilometer (15-mile) subway line. Already these digs have unearthed an Augustan era public building, taverns, parts of 16th-century palaces, and Roman tombs, though presumably the primary objective of these archaeological probes is not discovery but to minimize delays and to avoid the cancellation of the whole project should there be any significant find. 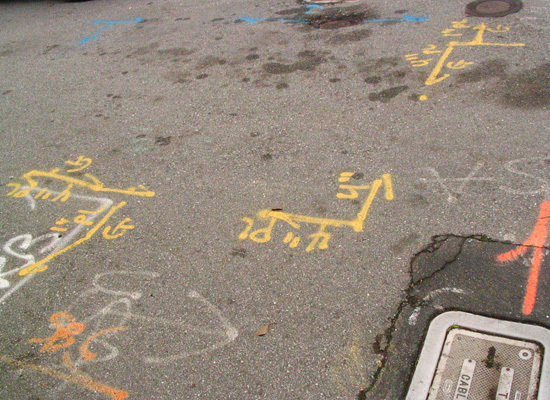 Of course, the whole planning would go a lot simpler if the metropolitan engineers only had to call a three-digit phone number, and within a day or two, thousands of years of history are marked for them on the ground. Where it looks the least cluttered cartographically, the subway goes. While we are still on the subject of urban underlayers, permit us to include this National Geographic illustration of New York's subterranean landscape. Digging anything in New York requires careful examination of mechanical drawings that take into account items over 100 years old. 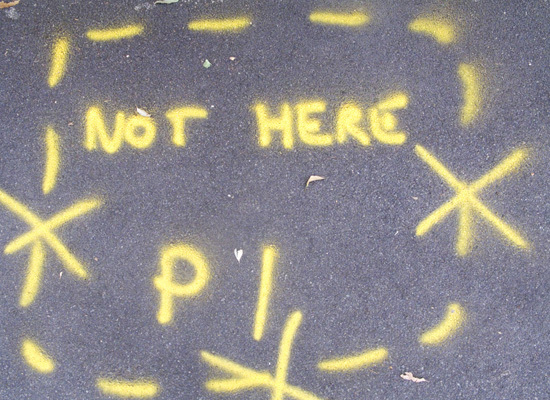 Careless digging could knock out blocks of utilities and cost millions of dollars to repair. Engineers today must rely on long-dead predecessors for accurate records of past work. These maps, new and old, are closely guarded; in the wrong hands, they could bring all of New York to its knees. For the scale version of the illustration above, go here. 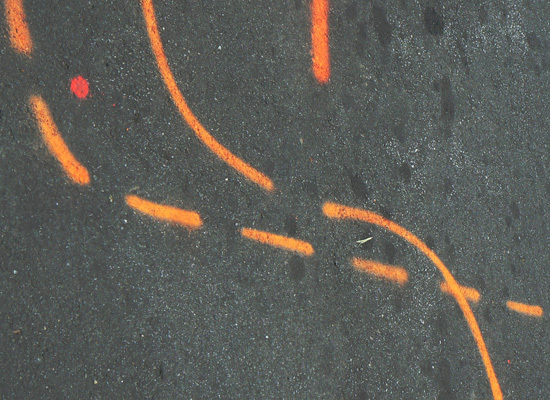 And for a completely different underground tour, see our post on Negative Manhattan. Finally, to return back to the surface, we can't help wondering whether you actually need to dig in order to make the call? What if we merely want to summon the locators just to see what's under there? Is simple curiosity enough? What if we just want them to spray paint the ground around the house so that we could have a sort public art installation, an homage to Richard Long, for our next garden party? 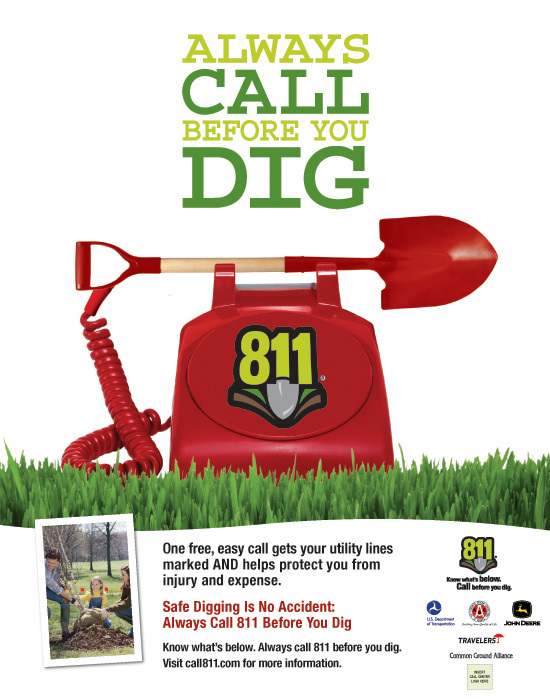 In any case, don't forget to call 811.